By acting without reason, but with maybe one foot still grounded in reality, fools fool around, mess around, play around in casual frivolity. It's pure play and unstructured improvisation, without apparent goals, and the only rule is there are no rules. One dictionary even uses the word irresponsible in the definition. It's that state of mind where you are not too serious, lightly detached, a little lazy, willing to be messy and make mistakes. You doodle around with your problem or an idea until something gells and more ideas take you by surprise--or you take them by surprise. You work from your instincts and impulses without censoring, seeing what comes to mind and body. By not focusing on finding a solution, accidents will happen that solve the problem anyway. I'm not sure where this originates (I first heard it in a creative writing class taught by Daniel Keyes), but it's been taught as an approach to creative writing that writers should figuratively vomit on the page and clean it up later. The first part (vomiting) has been called Free Writing, and its principles can be adapted to any creative endeavor. I've found Gabriele Rico's clustering technique as a quick way into the fooling around state. 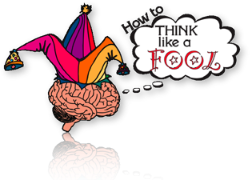 Think: Why not fool around for awhile and see what happens?